The elegantly flowing, organic lines of Fluid textured glass truly set it apart. This innovative glass design leaves an impression of freshness and calmness. 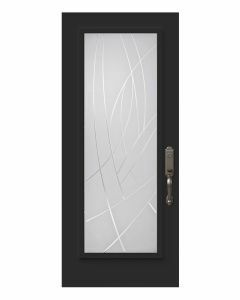 Its bold yet simple pattern is well suited for contemporary or natural style entrances. Spacer : Novatech uses aluminium spacers in stained glass products. Insulated glass size : 22×64", 7x64", 22×48”, 8×48”, 22×36”, 8×36”, 22×14 ⁷⁄₁₆”, 22×17", 22×12", 12×12"
Opening size : 23×65", 8×65", 23×49”, 9×49”, 23×37”, 9×37”, 23×15 ⁷⁄₁₆”, 23x18", 23×18", 23×13", 13×13"
- Change the standard metal caming bars for one that better suits your needs. For example: zinc, brass, plated, etc. 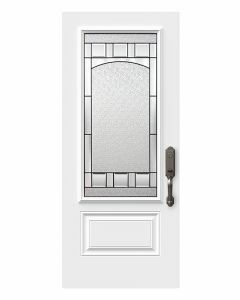 The choice of stained doorglass, combined with a matching stained glass sidelites and transom, will bring unmatched distinction to your home. This Chic configuration will add beauty and value of your home. It is possible to change some of your stained glass panes to adjust the level of privacy. See the «Custom» section for more information.